Located in one of the prettiest towns on the Côte d'Azur, yet within close proximity to Nice and Monte Carlo, this refurbished 60m2 (internal area) apartment's benefits include a large 25m2 (external area) direct sea facing terrace, swimming pool, private parking, air conditioning and resident caretaker. The beach, old town shops and restaurants, railway station and bus stop are all within 10 minutes downhill walking distance. Great care has been taken to refurbish the entire apartment to a luxurious standard. The finish, including fixtures, fittings and furnishings, is meticulous. Linen, towels and heating are also provided. (Menton/Ventimiglia) for 15 minutes through stunning scenery, alighting at the apartment. Car hire from the airport is available by arrangement and the easiest route to the apartment is to follow the Bay des Anges to Nice Port then proceed along the Basse Corniche past the centre of Villefranche, finding the well sign-posted Les Restanques some 300 metres further on the right. Exterior: The lovely shared swimming pool is accessed by taking the lift to the ground floor and then wandering along the paved path through the beautifully tended garden. Once more, the setting of the swimming pool provides breathtaking views across to Cap Ferrat. Interior: The lounge furniture comprises two settees, a sideboard/dresser, large coffee table with storage within, television cupboard/stand with internet TV and DVD. There is also a small bar area. The luxury fitted kitchen is fully equipped and includes solid wood work surfaces and dining table with chairs, which separates the kitchen and lounge areas. The main bedroom furniture comprises a king size double bed, a large three-section wardrobe, bedside cabinets and console table with mirror above. The separate seating alcove / dressing area also contains two shelf/work areas. The luxurious bathroom features marble tiles throughout and includes a symmetrically designed bath with central hand shower, wash hand basin over towel storage unit, mirror above basin, toilet and douche, heated towel rail and two further storage units. The double bedroom has a king size bed The property is suitable for the elderly or infirm however please note that Villiefranche sur Mer is a hillside town & most walks including to the beach & old town involve downhill to and uphill back. Additional lightweight mini pool chairs are also provided. The apartment is fully equipped with everything you are likely to need from just sleeping there to full self-catering. All fixtures and equipment are of a high standard and the building is of an higher level overall. It was still too cold to use the pool but it certainly looks inviting. The terrace view is spectacular and we could hardly tear our eyes away from it the whole time we were there. We used buses for all our transportation and there are stops very close by. Figuring out the schedules is another matter altogether! Nevertheless, it is very easy to get into Nice or Bealieu (best for grocery shopping). Recommend bus over train if arriving with luggage as the station is some distance below. Would recommend this property to anyone holidaying in the Antibes-Monaco area of the Riviera. This was our 4th stay in Rob & Mandy's apartment (which says more than words could say). We spent Thanksgiving week here, and it was a wonderful choice, weather-wise, jackets optional during the day; needed at night, but comfortable. The apartment is so well situated relative to bus stops and the train station, and this time we discovered and used 7-day, 15 Euro bus passes. They don't get you back from Monaco, but allowed us to freely take the bus during our stay. The apartment is an exceptional deal, with a million-dollar view from the deck, comfortable living room, complete kitchen and comfortable bed. We enjoyed excellent meals at La Belle Epoque (right down the hill) and L'Aparte (one block above the waterfront, hidden in an alley). We recommend both restaurants - L'Aparte is more upscale, but both have wonderful food. We are already looking to plan our next trip back and are looking forward to retirement, when we will come for more than a week. Great quality in every part of the apartment. Fantastic equipment, great cooking, great comfort. We will return to our favourite haven many times we are sure. This apartment and it's location didn't disappoint in any way. We had a weeks holiday at the beginning of November. The weather was fantastic, the views were brilliant and Villefranche Sur Mer is a delightful little coastal town. The apartment is well equipped and well maintained and extremely comfortable for 2. It was very easy to get around (even without a car) We had a very enjoyable stay. Fabulous vacation retreat. This rental was exactly how it was described and fully met all our needs. We have stayed in Villefranche before and really needed to come back again. This time our friends could not join us so we needed a place suitable and affordable to 2. This was just the place! The layout was very well done with full on sea, and Cap Ferrat views from living area and bedroom and even a bit from the bathroom looking through the house. The terrace was outstanding and great for a couple of our dinners at 'home' and a few breakfasts too when we weren't running out for Pastries. A steep but quick walk to the main part of town, groceries, a butcher, everything you need. The on-sight host, Maria and her little dog Nui, were very sweet and accommodating. You will fully enjoy this place. It's perfect for a couple and is suitable to add 1 more comfortably. A 4th might be much. Villefranche is heaven. Enjoy!!! A lovely apartment with amazing views. It was easy to find from the directions given, we made our way by two buses from Nice airport. The bus stops outside the apartment, its also easy and cheap to travel to other resorts along the coast. 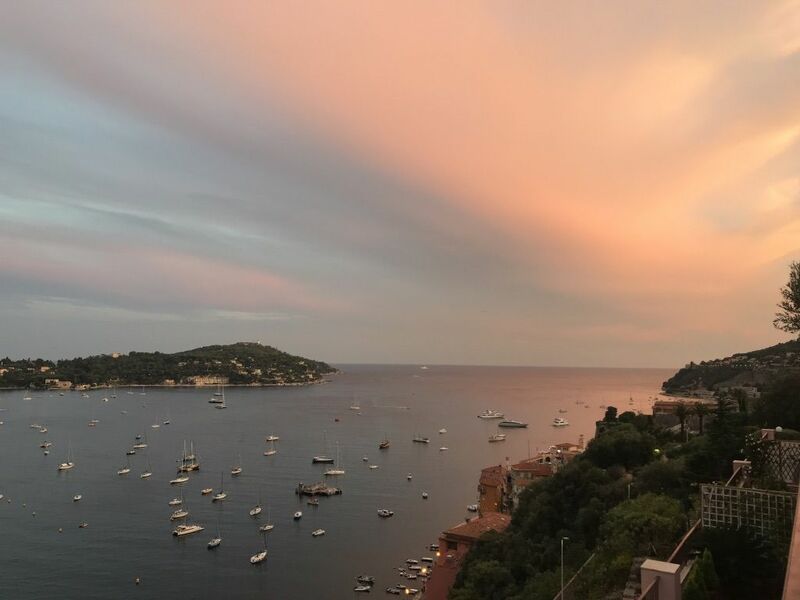 We ate in most nights, the kitchen has everything you need, we found two small mini-markets in Villefranche and a large supermarket in Monte-Carlo, there are restaurants in Villefranche if required. Thanks to the owners and caretaker, all were very helpful and we will hopefully be booking again for next year. The picturesque town of Villefranche-sur-Mer slopes down to a beautiful horseshoe bay. Explore the narrow, fascinating streets of the old town which manages to combine French village life with the influx of visitors it enjoys on a year round basis as one of the most scenic spots on the Côte d'Azur. Prices include provision of bed linen, towels, air conditioning (in summer), heating (in winter), electricity and hot water. In accordance with normal French custom a 'one off' laundry and cleaning preparation charge of 150 Euros is payable directly to the housekeeper on arrival along with the security deposit of 250GBP (or Euros/USD equivalent), which is returned on departure if no damage occurs. The usual changeover day is Saturday, however other days will be considered by request.